When you’re looking for a fresh idea for a light summer luncheon or brunch, try this simple, but tasty open-face Italian pie. 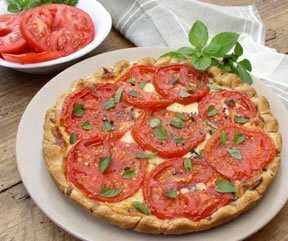 This Tomato and Cheese Pie recipe is a fun and tasty way to use your harvest of fresh garden tomatoes. Our step-by-step guide will show you how you can make your own salsa. When you make your own salsa you can adjust the taste to your liking by adding more or less vegetables. Let us show you a quick and easy method to use for peeling the skins off tomatoes when you are processing them.